Hello! I’m Sheri and I’m Yogini on a mission. Watch out cuz here I come. I’m Sheri Matthews! 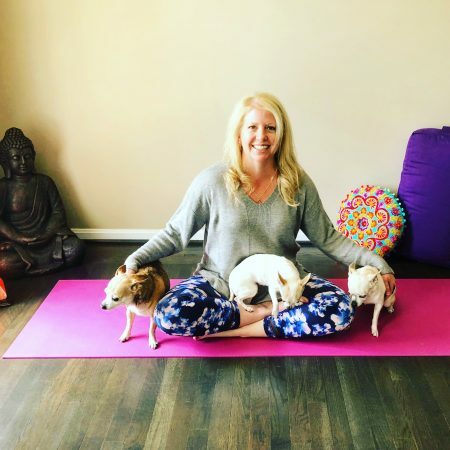 I’m the founder of Live Free with Sheri and the Yoga & Recovery Club. a cancer survivor and a recovery warrior. Teaching and sharing yoga, meditation, mindfulness, wellness and a healthy lifestyle is my calling. Helping people heal and find some relief from chronic pain, addiction, PTSD, trauma, stress, anxiety, and depression is a blessing and I NEVER take that for granted. My purpose and specialty is to motivate and teach people how to feel alive, cultivate more joy, live in the present, move beyond addiction, and stay committed to their health and well-being. This idea comes in many different forms depending on the individual. We can achieve these goals through movement, meditation, breath work, lifestyle, self-study, self-care, and self-love. I thrive on finding a sense of balance through laughter and humor even when we’re moving through our darkest times. I’m so grateful for where I’m at today. In my life, my health and well-being, my yoga practice, but most importantly the gifts I get to share. Giving back what was so freely given to me. This didn’t come with a price, I can tell you that. I’ve had to move through and do a lot of deep, dark, and personal work to get to where I’m at today. Addiction, alcoholism, anxiety, depression, and then cancer. Yes! I said it… The BIG C Word. You can say I have a few tricks up my sleeve and come armed with a pretty badass spiritual toolbox. I’ve been practicing yoga 20 years, and been teaching almost 10. I know and truly understand the struggles with sobriety. I understand the feeling of loss and grief. Losing my mother to cancer unexpectedly then getting diagnosed a year later myself. My Ignite Your Inner Warrior series has been a passion and calling of mine and I’m excited to share it with the world. We are in the need of healing and deserve happiness. Joy is our natural birthright. So What’s it All About You Ask? I’ve broken out into two different workshops and we can decide what works best for your space/studio and clientele. I created two different series since we are focusing on two different, deep, and personal topics. My Inner Fire Warrior Series is just this… How can we take these heavy topics we’re moving through in life and move through them with humor #1 (this is a nonnegotiable), clear intentions, grace, ease, and a powerful mindset. Well, we do it through yoga, lifestyle, meditation, mindfulness, and wellness. My area of specialty is Recovery, Addiction, PTSD and Cancer. I’ve been through all of this myself, understand it and it’s near and dear to me. What is my purpose and intention for you? HUMOR + HEALTH + HAPPINESS = HELL YES! I want to teach you how to find the humor in your difficult times. I want to share with you tips, tools, and techniques to live a healthy life. And, most importantly… I want you to be able to find happiness and joy even when it doesn’t seem possible. I can tell you… It is! But, it’s a process. I’m not going to lie. We have to make a commitment, and we have to show up for ourselves every damn day and do the work. Sounds awesome… Right?! Trust me… It is! My passion is building community and thrive at it. I’m real, raw, funny, authentic, and I create the space for others to feel the same. And, because what I’m sharing has changed my life I’m confident it will have an impact on yours. Let’s spread the love, peace, laughter and joy to all through yoga, mindfulness and meditation! Ignite Your Inner Warrior! Let’s get Booked! Reach out for my availability here and I can’t wait to see you on the mat! Start living Healthy, Fearless & Free! Create a life you are wildly in love with!